This page is a translated version of the page Ancora and the translation is 100% complete. Although not famous as Aurora and Omas, Ancora is one of the most important brands in the Italian fountain pen history. 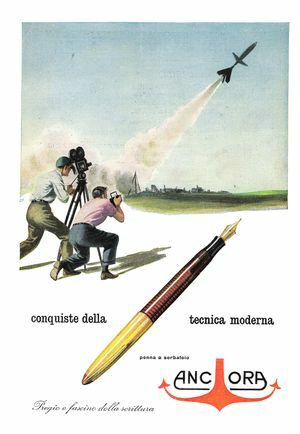 While the brand did not created relevant technical inventions, nor distinguished itself for design originality and innovation, often producing models clearly inspired by those of the most famous brands, the pens that Ancora produced were excellent, and remarkable for the quality of their celluloid, proposed in beautiful and original colors. The company was between the most relevant Italian brands up to '50s, but as it was for all the other fountain pen manufacturers, she underwent the crisis due to the advent of the ballpoint pen that caused its gradual decline until the final closure in 1975. Like it happened for other historical companies, the brand Ancora was reused starting from 1988 for the production of modern fountain pens. According to A. Lambrou and others Ancora was founded in 1909 by Giuseppe Zanini, in Sesto Calende, on the shores of the Lake Maggiore. It is not known from what source Lambrou infers such a date, but the official website of the company although whitout indicating any source, talks about the beginning of his activities in 1919, consistent with what is indicated by many others. There are also some invoces from 1941 showing the claim Casa fondata nel 1902, but this probably refers to the begininng of Zanini commercial activities, not to Ancora foundation. Ancora initial history is quite clouded, we know for sure that Zanini began its activities in the field of writing articles in Bologna, where apparently he was in contact with Armando Simoni (founder of OMAS) and where there are traces of his activities dating back to 1918. In 1920 he founded with a partner, Clerici, a company named Fabbrica e Commercio di Penne Stilografiche e Raffinati Oggetti per Arti Grafiche. The production of these early years was not yet clearly identified by the trademark Ancora. The official website of the actual trademark holder reports the purchase of a stationery shop in Bologna and the beginning of the production of fountain pens in 1919. The collaboration with Clerici continued until 1924, when Zanini founded his personal company, with the name Fabbrica di penne stilografiche e commercio, stampe in genere e riproduzioni opere d'arte. In 1925, the activity thus far hosted in Zanini own house, was moved to Sesto Calende. The Ancora trademark (Reg. Gen. N. 40112) was indeed registered only in 1929. In 1938 the production was moved to Arona, where new plants were created. After the death of the founder, the son Alfredo took over the management, up until 1975 when the company was closed. 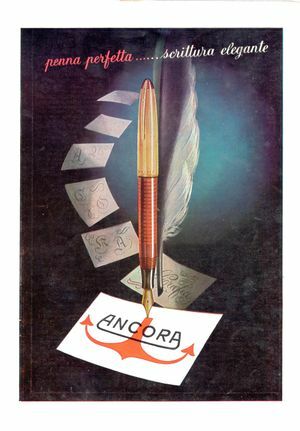 An Ancora advertisement from '50 for the Lusso model. Unfortunately Ancora models history is highly clouded, because there are no catalogs or model listings. The Ancora initial production consisted of relatively conventional pens with the classic safety filler. They were made in chased hard rubber, but some luxury model were produced with gold filled overlays; these were usually made in 18k gold plated metal, some full gold models have been found, but apparently silver was never used. Typically, these overlays are marked with the Ancora name in uppercase letters at the bottom of the cap, but some have the company logo, an anchor, in blue over white enamel on the top of the cap. The same decoration can be found also on the hard rubber models. Since the '20s the Ancora branded safeties were joined by the sub-brand Rapid, that remained in production until about the '40s. This sub-brand was associated only with pens made with precious metal overlay, that were marked with the name Rapid and the letters "G.Z." within a diamond on the cap. The nib was still marked Ancora or Warranted with an engraving of an anchor and the initials "G.Z." Whitin this line, especially in the '30s, have been designed some overlay with the most refined and elegant decorations of that time. 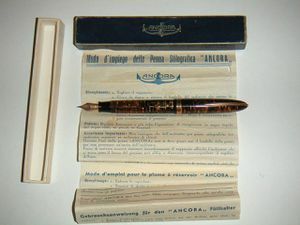 Around 1930 Ancora produced the first celluloid models, clearly inspired by the Parker Duofold, with hard rubber black ends, a ball clip and button filler. These models were produced in two sizes, using marbled, black or single colored celluloid. They were soon followed by other models with slightly tapered end, produced in a colorful celluloid; now these early celluloid model are very rare and highly sought by collectors. In the first years of '30s Ancora introduced a new top model, the Duplex a more streamlined lever filler pen, produced in four different sizes: lady, medium, senior and oversize. The Duplex had a wheel clip (like the one used on the first Doric models), with three cap rings on the bottom of the cap, one on the top and other two rings on the barrel: one just under the cap and at the other at the end. All finishes were gold plated, and the nib was 14k gold. There are also alternate versions, with button filler, a ball clip, with a single ring on the bottom of the cap and different celluloid patterns and colors produced in just three sizes, but all have the anchor logo and the words Duplex marked on the body of the pen. In the late '30s two new models, called Da-Ma and Maxima were produced. They were high quality pens made in many beautiful colors, using also a laminated transparent celluloid similar to the one used on the Vacumatic. The pens were equipped with an innovative plunger vacuum filling system, with a gold plated roller clip and three cap rings. The difference between the two model was that Maxima was rounded when the Da-Ma was faceted, like a Doric (or an Omas Extra). The Da-Ma, was also produced in a lever filler version, and in four sizes, when the Maxima only had two sizes, it also had a two-tone nib featuring the logo of the anchor. Launched by a large advertising campaign, the Da-Ma model was a good selling success, but the filling system, as it was innovative, proved to be very fragile from a mechanical point of view. Many pens went back to the factory, where the filling system was changed to a button filler, losing the transparency of the pen body. An Lusso advertisement from '50. After the war the Lusso model was introduced. It was a torpedo shaped pen, and also the clip reminded the same shape and had the anchor logo on it inside an enameled oval. The Lusso was produced in four sizes, and made with transparent ringed celluloid in many different colors. The cap was decorated with tree ring, but some models were made with a gold plated or laminated cap, decorated with a top celluloid inlaid. There also produced some alternate lever filler model in a variety of marbled, veined or rolled colors. Alongside the Lusso models were also introduced some lower prices lever filler models, always celluloid made, produced in many different marbled, veined or ringed colors, with a straight clip and a single ring on the cap. Were also produced some more traditional models, always in celluloid, equipped with lever filler, piston filler or button filler loading system. In the late '40s Ancora, trying to follow the Parker 51 success, introduced an hooded nib pen, called Calamus. 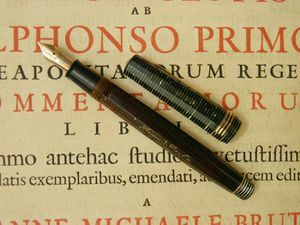 It was a piston filler pen with the same shape and finishes of the Lusso, produced in four different sizes in full metal or with metal cap and plastic body with four different colors: black, gray, burgundy and blue. There were two version of the pen, with a partially covered nib and an gold filled overlaid section, and with fully covered nib. The cap was still made in gold-plated metal with a celluloid inlay in the top, while the body was engraved with the name of the model. The first Calamus models were produced having an enameled logo on the clip. During all the '50s Ancora continued also to produce traditional celluloid models. There are also two Ancora sub-brands; the first one is the Rapid, a name which was used only for safety models produced with precious metal overlays. The second one is the Goliarda a name that the the company used for the production dedicated to the student market; these are generally inexpensive pens, but still elegant and quite good on construction, produced from back to the '20s. They were always marked Goliarda, the first safety model were only marked Goliarda - Marchio Depositato with no reference to Ancora, later models used the anchor logo. During '50s and '60s, the company, like almost all fountain pen manufacturers, underwent a steady decline as it was hardly hit by the crisis due to the introduction of the ballpoint pen. Ancora continued to produce some piston filler plastic models, however its fountain pens never reached the success of its best years, and in 1975 the company ceased operations. Section of the official site, almost empty (some documents were removed). ↑ there is some uncertainty also about the surname of the founder, because there are documents reporting both the Zanini and the Zannini names, but no convincing explanation of the appearance of an extra "n". ↑ the company's website is not very reliable, there is a big error in the Zanini birth date, badly transcribed in 1897 when the birth certificate posted on the website (no more present) showed the correct date of 1879, and after that it talked about a production of pens called... Aurora. ↑ in the Letizia Jacopini book La storia della stilografica in Italia 1900-1950 is published a report of start of activities for the Arti Grafiche - Giuseppe Zanini dated February 22, 1918. ↑ meaning Factory and commerce of fountain pens and fine objects for graphic arts. ↑ meaning Factory for fountain pens, prints and art reprints. ↑ both dates where reported by Letizia Jacopini in his book as result of a search in the Bologna Chamber of Commerce documents. This page was last edited on 24 September 2018, at 02:08.